THIS IS A ONE OF A KIND!!!!!!!!!!!!!! COPY THIS LINK ABOVE AND WATCH CHANNEL. 2 NEWS CBS FROM NEW YORK INTERVIEW! 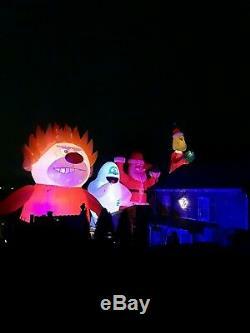 CUSTOM MADE TO 30' FOOT HIGH MASSIVE IN SIZE! YOU WON'T FIND THIS ONE AND THIS SIZE ANYWHERE ELSE!!!!! SO YOU RECEIVE FOR THE HOLIDAYS. I CAN MAKE ANYTHING YOU WANT AT ANY SIZE! From The year without a Santa Claus. Same as picture or customized. Storage bag for product and carton for blower. Included, CE 220v-240v or UL 110v-120v. The light weight of the material that can be installed and packaged is very easy, portable to be moved to any place for events. 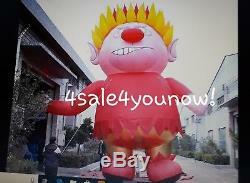 The item "30' FOOT MASSIVE CHRISTMAS INFLATABLE HEAT MISER CUSTOM MADE ONE OF A KIND" is in sale since Wednesday, January 2, 2019. 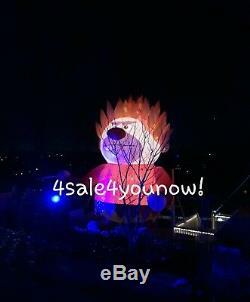 This item is in the category "Collectibles\Holiday & Seasonal\Christmas\ Current (1991-Now)\Yard Décor"." and is located in Bloomingdale, New Jersey. This item can be shipped to United States, United Kingdom, Denmark, Romania, Slovakia, Bulgaria, Czech republic, Finland, Hungary, Latvia, Lithuania, Malta, Estonia, Australia, Greece, Portugal, Cyprus, Slovenia, Japan, China, Sweden, South Korea, Indonesia, South africa, Thailand, Belgium, France, Hong Kong, Ireland, Netherlands, Poland, Spain, Italy, Germany, Austria, Bahamas, Israel, Mexico, New Zealand, Singapore, Switzerland, Norway, Saudi arabia, Ukraine, United arab emirates, Qatar, Kuwait, Bahrain, Croatia, Malaysia, Brazil, Colombia, Panama, Jamaica, Barbados, Bangladesh, Bermuda, Brunei darussalam, Bolivia, Ecuador, Egypt, French guiana, Guernsey, Gibraltar, Guadeloupe, Iceland, Jersey, Jordan, Cambodia, Cayman islands, Liechtenstein, Sri lanka, Luxembourg, Monaco, Macao, Martinique, Maldives, Nicaragua, Oman, Peru, Pakistan, Paraguay, Reunion, Viet nam, Uruguay.